You’ve probably been there before. While driving, your instrument cluster suddenly displays a “Tire Pressure Sensor Fault” message or warning light. But what exactly does it mean and how do you fix it? What is a Tire Pressure Sensor? What Does a Tire Pressure Sensor Fault Message Look Like? Can I Still Drive My Car? Who’s Going to Fix It? A tire pressure sensor is a small computer located inside each tire. It is designed to alert drivers of an under-inflated tire. 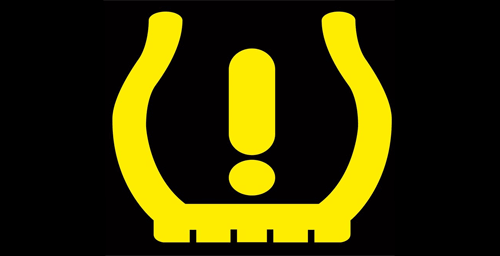 Tire pressure sensors, or TPMS for short, have been mandatory on all vehicles in the U.S. since 2007. There are two common types of tire pressure sensors. The first is a valve type: the sensor and valve stem are one unit. The second is a band sensor: the sensor is mounted to the inside of the rim with a metal band. Both sensors illuminate the dash light when the pressure reading is lower than it’s supposed to be, alerting the driver to a tire with low air pressure. 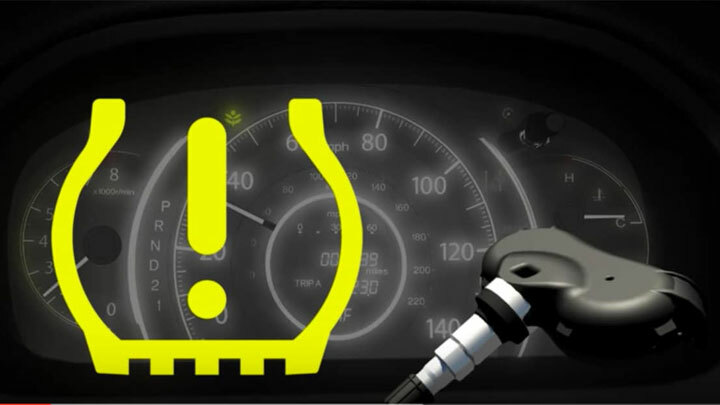 When a tire pressure sensor detects a problem with tire pressure, it will send a signal to the car’s computer, which will then illuminate a light on the dash. This light is generally bright yellow, and looks like an exclamation point (! ), inside of a “U” shaped symbol. This is the drivers warning to check on their tires, as one may be flat or just low. Driving on an under-inflated tire can cause the vehicle to pull in one direction or the other, depending on which tire is low. This will cause the driver to have poor control over the vehicle, which is very dangerous. Driving on a low tire can also at the least cause unbalanced tire wear and at most cause damage to the structural integrity of the tire, mainly the sidewall. This eventually can cause a blow out to occur once the tire is re-inflated. Driving on a completely flat tire will require that tire to be replaced due to this damage. If you’ve confirmed that the tire pressure is adequate in all of the tires, then the the sensor has simply failed. At this point, the only concern the driver will have is the light glaring at them from the dash. 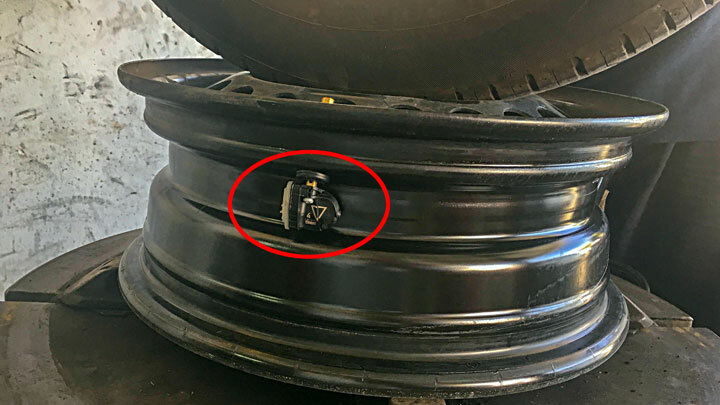 A failed sensor will require the driver to be more attentive to the pressure in their tires, since it is not reading the actual pressure anymore. This should be fixed at the earliest convenience for safety reasons. The quickest and easiest repair for this issue is to check the pressure of all the tires with a quality air pressure gauge. These gauges can be picked up at any parts store and even most gas stations. Don’t forget to check the spare tire too! Many vehicles have a pressure sensor in the spare and it is often overlooked. As little as 5 PSI under the manufacturer recommended pressure can cause the dash warning light to illuminate. The manufacturer recommended pressure can be found in the owners manual, or on a sticker located on the drivers side doorjamb. If checking and adjusting the tire pressure to within the proper specs does not remedy the problem, chances are good replacing the tire pressure sensor is necessary. The failed sensor can be identified using an OBD2 scanner, or through the vehicle’s dashboard computer options, depending on the model. While having an automotive scan tool will let you diagnose the problem yourself, you can always have a local tire or repair shop perform a scan to quickly identify which sensor has failed. The battery life of these sensors range anywhere from 2 to 10 years. In order to replace a failed tire pressure sensor, the wheel with the bad sensor must have the tire dismounted. Once the tire is off the rim, the old sensor can be removed and the new one installed. After the new sensor is put in the rim, the tire will be remounted and inflated. Then comes reprogramming so the car’s computer will recognize it. Since most car owners don’t have the capability to dismount and remount a tire, a trip to the local tire shop is necessary. Fortunately, the process isn’t very expensive and you can usually purchase the TPMS sensor cheaper on your own to save some money. The reprogramming process varies for each vehicle’s make and model. Some cars require a certain amount of mileage to be put on the new sensor for the computer to recognize it, usually just a couple miles. Other vehicles must be reprogrammed using the same scanner that found the bad one. The scanner programs the sensor’s signal to the car’s computer so the two can communicate. Without this, the dash light will stay illuminated because the computer can’t read the new sensor, making reprogramming a crucial part of the replacement. The cost of a tire pressure sensor replacement varies with the car. The main cost of this repair is the sensor itself. Luxury brands, such as Audi and Land Rover, will have a much higher sensor cost than Ford, Honda, or Toyota, for example. These sensors can range anywhere from $50 up into the hundreds, for a single sensor. The labor that goes into replacing the sensor is minimal, usually in the range of 1/2 to 1 labor hour per sensor. It is important to keep in mind, the cost of labor is different at all repair shops. A big name dealership will have a higher hourly labor cost than a small family owned repair shop. Some shops will also charge a reprogramming fee. Always be sure to ask about hourly labor costs and reprogramming fees when looking for a place to replace the sensor. Choosing a place to have a repair of any sort done is solely up to the owner of the vehicle, and sensor replacement is no different! Of course, it is always recommended to choose a repair shop that is trustworthy and reputable. Avoid those shady places! However, when it comes to tire pressure sensors, a big name dealership is not always the best choice either. A local tire shop should have the capability and knowledge to replace the sensor correctly. Be sure to inquire about labor and part warranty when having any kind of work done at a shop. No one wants to spend money on a repair, just to find out the part was faulty or the labor done wrong.